In a Nutshell: The process of finding a great APR on a loan used to take consumers serious effort. They would fill out applications with numerous lenders, negatively impacting their credit scores each time a hard inquiry was made, and reducing their chances of keeping that APR low. EVEN Financial uses a platform that simplifies the process. In under a minute — and at no cost — you can fill out a simple form and be matched with loan offers from numerous alternative financial agencies, taking banks out of the mix and allowing more of the population to secure loans. In effect, EVEN Financial gets the lenders competing for consumers in an easy and secure way. As a result, the company processes over $250 million in loan applications each month. After months of searching, you have your sights set on that shiny new car on the lot at the local dealership. You’ve compared prices and done all the research, and you decide this is going to be your next vehicle. You even picked out a name. “Lucy” has a nice ring to it, doesn’t it? The next step is actually figuring out how to pay for it. Sure, the salesperson will set you up with a loan because it’s in their best interest to close the deal. However, how do you know you’re getting the best rate? An inflated APR can cost you thousands of dollars over the life of the loan. Finding the best loan offer used to be an arduous process. It meant filling out applications in person or online, one financial entity at a time. Fortunately, EVEN Financial has simplified the process, using your credit score to match you with the best alternative finance lenders for your needs at no cost. That’s why they process over $250 million in loan applications each month. They take the salesperson out of the equation, saving you money, and putting you in the driver’s seat of finding an ideal loan that fits your needs. With a lightning-fast, secure interface, EVEN can help you secure loans of all types and get you behind the wheel of your own financial future. From finding a loan for your new car or home improvement project to covering unexpected medical costs, EVEN matches you with lenders that best fit your needs. It’s a free service and it works for anyone. If you have excellent credit, you’ll likely find yourself with a lower APR on your loan offer. However, if your credit score is just OK or low, EVEN Financial will lead you to useful tools to help consolidate your debt. EVEN has extensive connections with every major alternative finance lender and they’ll likely be able to connect you to a company that can help fund your loan. Some of their partners include Avant, Backed, LendingClub, LightStream, Pave, Prosper, Rise, SoFi, Upstart, and Ascend. SVP Business Development Raed Khawaja, formerly at Bankrate, is new to the EVEN Financial team. If you have a credit score that is too low to get a loan approved, EVEN can put you in touch with other services that can help you improve your financial standing. “If we can’t get you pre-approved instantly through our lenders, we’re going to try to at least provide you with another product that might be useful to you [such as a] debt consolidation program or a free credit report,” Raed said. When using EVEN’s API, you will find a simple, responsive interface. You will be asked how big of a loan you need, what it’s for and your approximate credit score to get started. EVEN can arrange loans as small as $1,000 and as large as $100,000. Loan categories include everything from student loans and home improvement to loans for cars or other large purchases. Credit score options range from excellent (760 or more), good (700-759), fair (640-699), or poor (less than 640). EVEN is for everyone, not just people with great credit scores. After inputting your information, EVEN will quickly show you top results for the lenders that match the type and size of loan you’re looking for. Some lenders specialize in certain types of loans. You may not know these details, but you don’t have to because EVEN does. EVEN Financial’s platform allows lenders to prequalify consumers based on the provided information. EVEN uses a sliding scale to show you what APR range you’ll fall under and what your monthly payment would be over the next 36 months for each lender offering a preapproved loan. You can get personalized and preapproved loan offers in less than 60 seconds by filling out a simple form that includes information such as your highest level of education, employment status, annual income, pay frequency and Social Security number. EVEN Financial helps match you with the ideal lender for your needs and credit score. One disclaimer is that there is no guarantee your loan request will be funded. The information you fill out on EVEN’s pre-approved loan page automatically populates the form you’ll need to fill out on the actual lender’s page, so 90% of the work will already be done when you get there. Lending sites may require additional information or documentation such as bank statements, passports, and driver’s licenses. While your loan application may not be approved, the odds of success are much higher when loan providers already have most of the information. One thing that typically scares consumers is how multiple inquiries will affect their credit scores. Inevitably, a lender is going to have to make a hard inquiry before signing off on a loan the deeper you get into the loan application process. By using EVEN Financial, hard credit inquiries are kept at a minimum and soft inquiries, which don’t negatively impact your credit score, are used. Just like your credit score, your personal information is also safe while using EVEN to search for a loan. EVEN employs 2048-bit encryption, a higher security standard than most banks, so users of the site can trust that their personal information is in good hands. They also double encrypt and isolate all personally identifiable information in a PCI Level 1 Service Provider Certified facility. EVEN Financial opened the doors of their office in the Chelsea neighborhood of New York City in March of 2015. They may be relatively new to the financial technology industry, but their startup has plenty of experience. EVEN Chief Executive Officer and Co-Founder Phill Rosen helped develop the Orchard Platform, another New York-based software startup that monitors loan performances for the marketplace lending industry. EVEN Financial Co-Founder Phill Rosen also helped create the Orchard Platform. EVEN Chief Product Officer and Co-Founder Jarid Maged was the Director of Product at LiveRail and a previous employee at Admeld, which was acquired by Google. Raed is new to the team, leaving behind a VP for Business Development position at Bankrate, and joining EVEN in March. EVEN has 14 employees now, and they have gotten in on the ground floor of an exploding market. The market size for the alternative lending ecosystem is $36 billion, but according to the University of Cambridge, it’s projected to grow to $1 trillion by 2025. The increase in the number of lenders has helped EVEN Financial’s profit margin as these companies are willing to pay more for quality customer leads. EVEN Financial has more than 100 affiliates including branded publishers, such as CNN Money and Smart Asset, and Lead Generation Networks. EVEN reports their partners see up to 30% approval rates using their technology, a rate that is significantly higher than the industry standard. EVEN offers partners easy ways to implement their platform into websites, including customized widgets and supplied API. They will even go the extra mile and build managed partner pages. 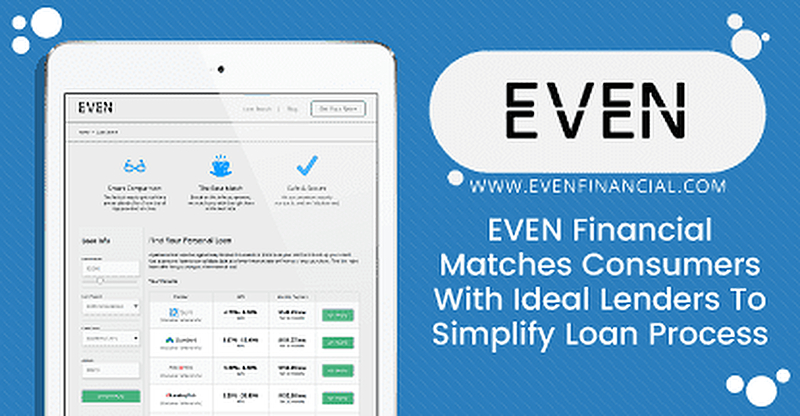 The process of matching with a lender that suits your needs has never been simpler or safer. And if your low credit score is holding you back, EVEN Financial can, with minimal effort, provide you with the tools to improve your financial standing. By taking less than a minute to fill out a simple form and using EVEN’s free matching service, hopefully, you’ve received multiple auto loan offers to pay for “Lucy” and chosen the company offering the lowest APR and monthly cost. Now you can use the money you saved to customize “Lucy” with rims and dashboard ornaments. You can spend the time you saved searching for the best loan offer to cruise around and show off your new wheels. After all, time is money. And by using EVEN Financial to find your ideal alternative lending source, you’ve just saved a lot of both.